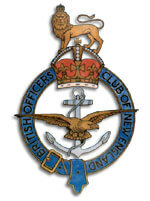 Welcome to the web site of the British Officers' Club of New England (BOCNE). The BOCNE is a private club dating back to 1921 which caters to the social needs of past and present Officers of Her Majesty's Armed Forces. The BOCNE has a long standing relationship with Boston and has welcomed the soldiers, sailors and airmen of Britain and the Commonwealth for over 90 years. The close relationship between Britain and the United States has always been a key element in the success of the BOCNE and as in years past, we continue to enjoy strong relations with those serving in the United States Armed Forces in and around New England. From the early days following the Great War when two nations joined in grief at the carnage in Northern France, to the unshakable alliance of the Second World War when the might of America came to the aid of an embattled Britain up to recent events in the Gulf, Boston has always been a welcoming port for Officers as near as Canada or as far away as Australia. The BOCNE is a social organisation which seeks to welcome active servicemen and women when they visit Boston, provide an ongoing social centre for expatriate Officers who have settled in New England, and those who have served in the U.S. Armed Forces and share an interest in British History. On the following pages, you will find information about the Club, our social calendar, contacting us, our history, in addition to links to other sites of interest.